Are you a picky dressage rider? Do you have a strong interest in the aesthetic, and seek beauty and harmony? 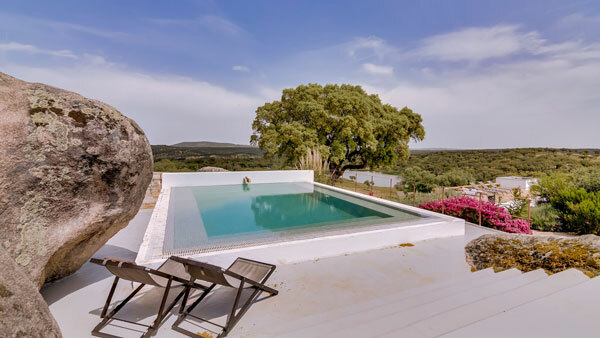 Then you have found your match in Diogo, owner and creator of this beautiful stud farm and luxurious boutique hotel. He is an architect and has a hectic work schedule all over the world. 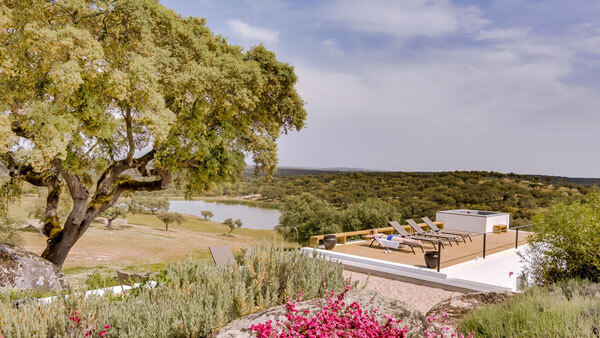 His beautiful farm is just over an hour from Lisbon, so you can also make it here for a long weekend. 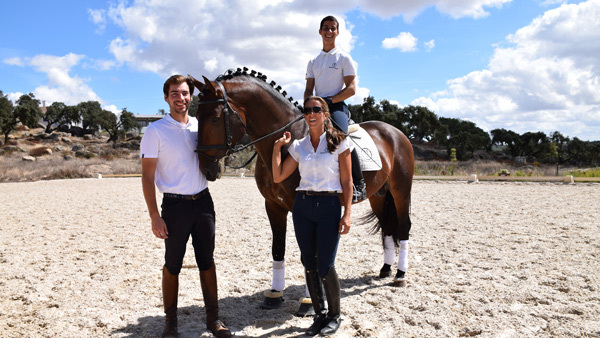 At his stunning country estate, Diogo has found his piece of paradise, where he enjoys and relaxes with his family and his beautiful Lusitanos. 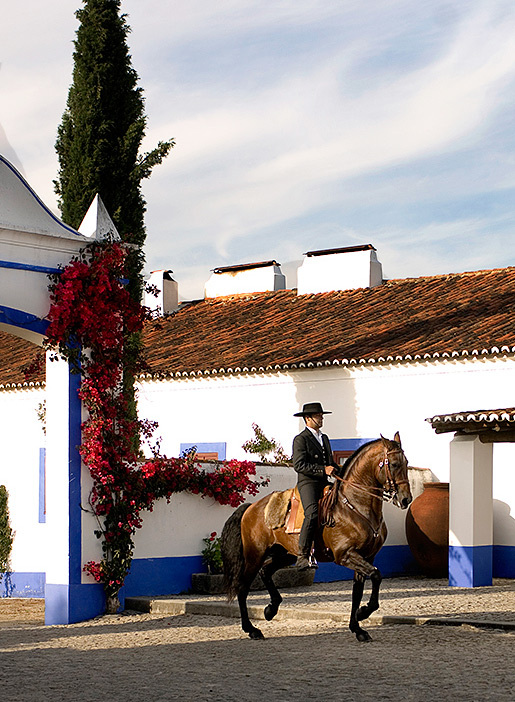 For twenty years he has bred Lusitanos with the goal to be able to compete with German and Dutch dressage horses. And now, one of his horses has been matched with a rider for the Olympics in Brazil in 2016. 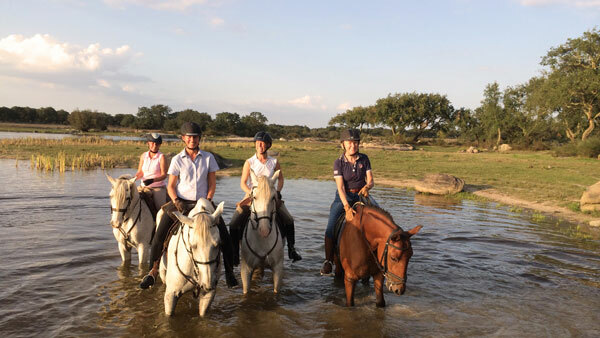 The atmosphere is warm and welcoming and the horses dearly loved and individually matched to you. To ride a horse that is well ridden from the beginning is a dream. You can then focus on your seat and giving the correct assistance. Your coaches speaks fluent English, are excellent instructors and calm. They will make you feel safe which, in turn, allows the development of your riding skills. You can also ride in the beautiful surroundings where you can ride for hours without seeing a single car. 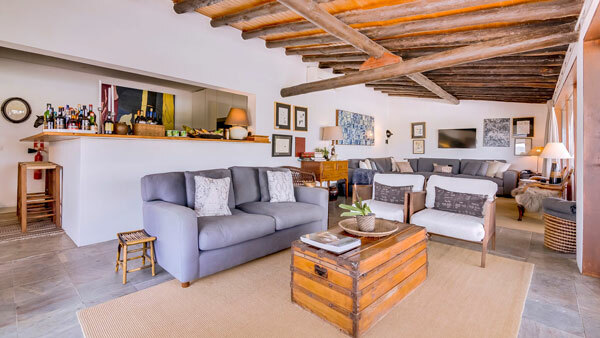 Diogo’s wish is that you also get to enjoy the best that he knows - beautiful horses, magnificent surroundings and tasteful design and furnishings. 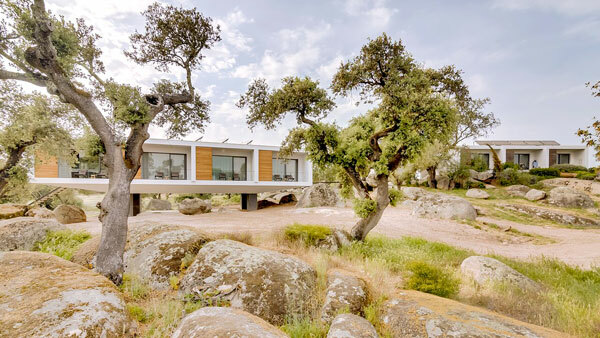 Diogo has built an exclusive small hotel where he has spared nothing and every detail is carefully thought out. 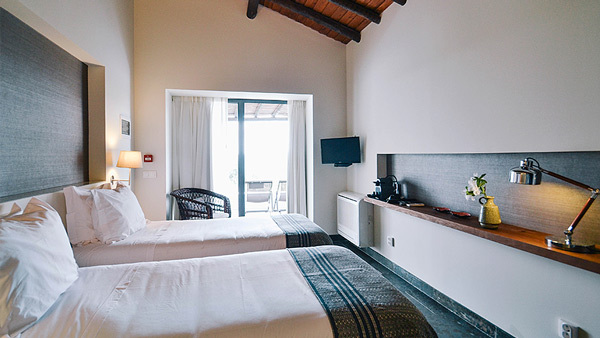 It consists of seven exclusive deluxe rooms of 25 m2 (269 sq. ft) and two standard rooms of 20 m2 (215 sq. ft) . 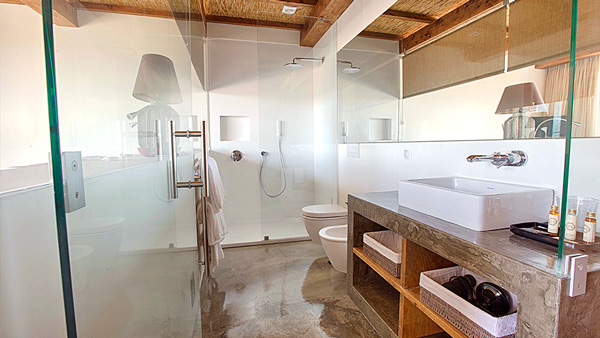 Stepping into the deluxe room is like stepping into the latest edition of a design magazine. 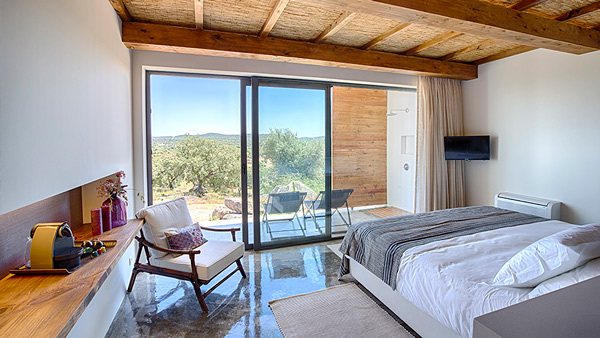 The materials are concrete, wood and glass and straight lines with plenty of natural light. 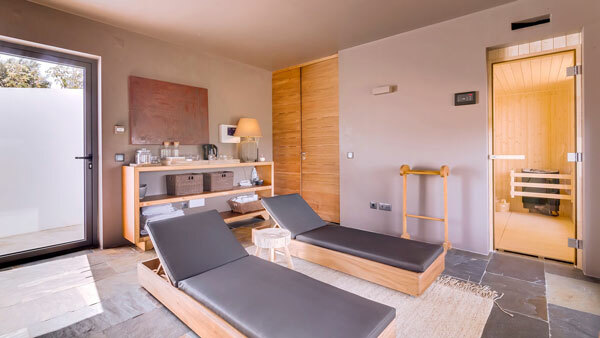 The Standard rooms offer a modern and minimalistic atmosphere, similar to that of delux rooms but in a smaller area though. 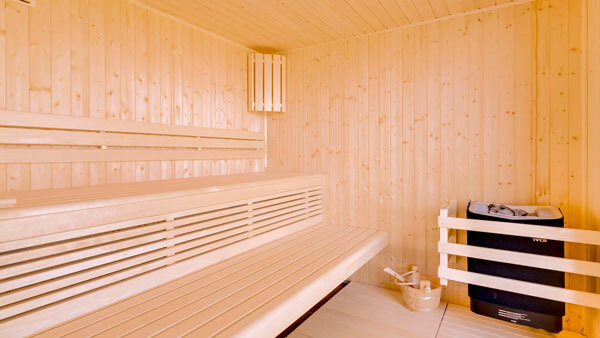 Single: It is possible to book one of the above room as a single room (price for single supplement is available under Dates & Prices). If there is no one to share a room with, a single supplement will be added. The food is also of high quality and cooked with finesse. The breakfast buffet has everything you need to get the energy required for your lessons. Lunch is often a substantial salad and for dinner you will be offered a tasty buffet. Of course, all meals are served with a good local wine. Dressage basic: Includes one dressage lesson a day. A total of 5 lessons over a week. 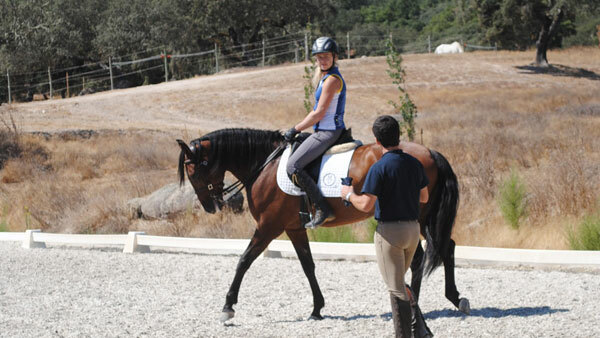 Dressage intensive: Includes two lessons per day. A total of 10 lessons over a week. 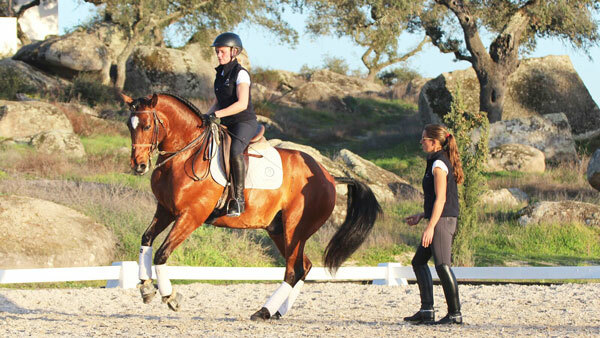 Dressage and Hacking: Comprising a total of 5 lessons and 5 outdoor rides of about 1½ hours each over a week. Dressage basic: Consists of a dressage lesson a day. A total of 3 lessons over a weekend. 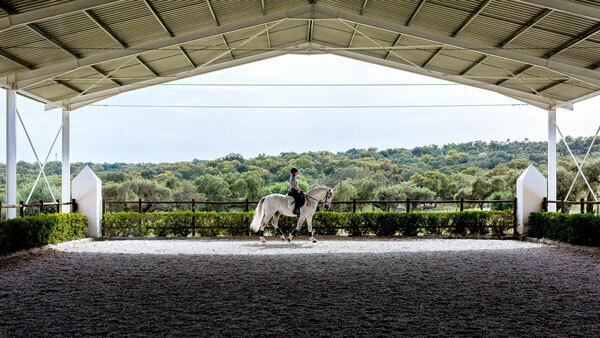 Dressage intensive: Two lessons per day. A total of 5 lessons over a weekend. Dressage and Hacking: Comprising a total of 3 lessons and 2 outdoor rides over a weekend. Horse people and riders usually do a fantastic job of taking care of their horses but easily forget their own part of the equation. Pia was amazed at the poor understanding riders have of their own bodies and how their health and wellbeing impacts on their riding. 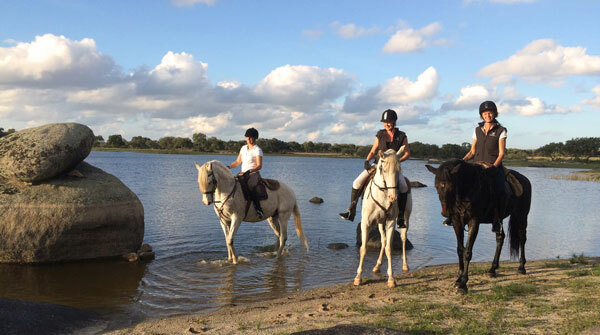 Pia has a genuine interest in horses and riding and has worked in health care since 1990 and with Yoga for more than 15 years, so for her it felt natural to create Sattva Equestrian Yoga. Sattva Equestrian Yoga has at its base yoga’s psychophysical systems and each rider’s need to improve their connection with their horse. A strong body, good balance, good posture, body control, coordination, better breathing techniques, increased awareness and focus are some of the building blocks she works with. Horses are large animals but very sensitive. Even a fly can provoke a reaction and whether the goal is a better result in a competition, or a leisurely ride in the woods, if you sit poorly and out of balance, you can imagine how much it affects the horse's health and ability to perform. Optional riding program and a yoga lesson per day for 5 days. 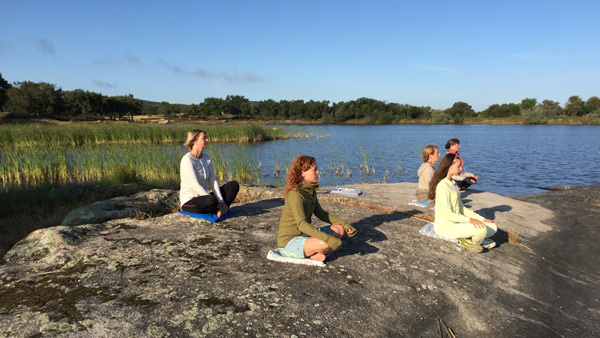 In the morning, before breakfast, there is free meditation = without leader. However, you get a little different techniques to work with independently. In the evening before dinner, SattvaEquestrianYoga 1.5 hours. Different themes every day with the aim of improving the rider's characteristics. Minimum 7 pers. maximum of about 12-15. If there are fewer than seven booked, we will just book the accommodation and riding programs (not yoga). 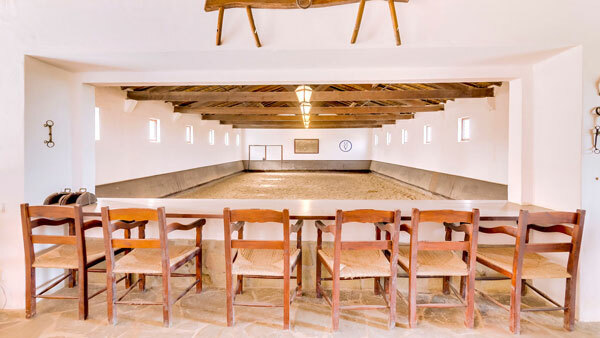 For bookings, click on the Alentejo week program below. 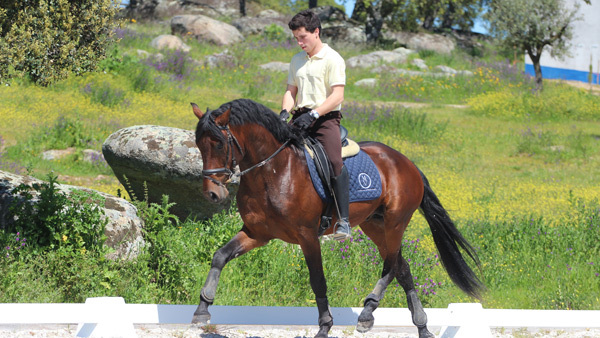 You will ride on dressage horses of the highest quality. 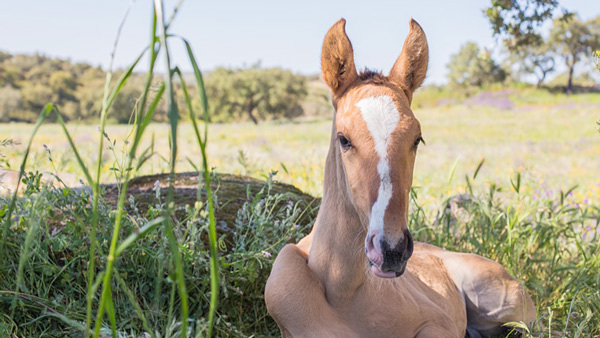 Every year, more foals are born, so there are horses of all ages and training levels. Week programs: 6 nights, 5 days riding, full board incl. wine with meals. Weekend program: 3 nights, 3 days riding, full board incl. wine with meals. 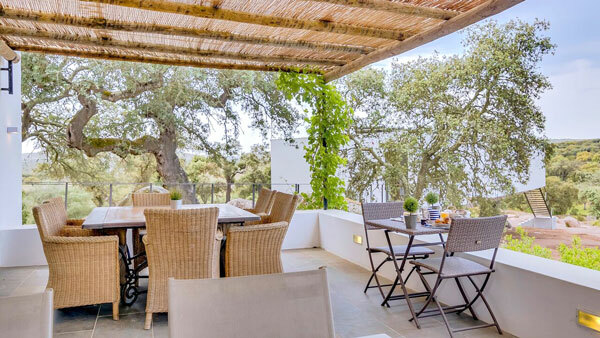 Not included: Flights, transfers, insurance, drinks and extras not mentioned. Transfer: Book in advance with HorseXplore and pay on spot. From Lisbon airport to riding center about 130 km. Price: 220 EUR /return /car, 1-4 persons. 440 EUR /return /car for 5-8 persons. Arrival-/departure day: The rooms are ready for check in at 4pm and must be left at 12am on departure day. The reception closes at 6pm, late arrivals must come with above transfer service. Week program: Arrival Sunday afternoon/evening, departure the follwing Saturday after breakfast. Weekend: Arrival Thursday around 3pm for your first lesson, departure on Sunday after breakfast. If you arrive Thursday evening you will get your last lesson on Sunday morning instead. Rental car: If you want to explore the surroundings on your own, we recommend a rental car. It is approx. 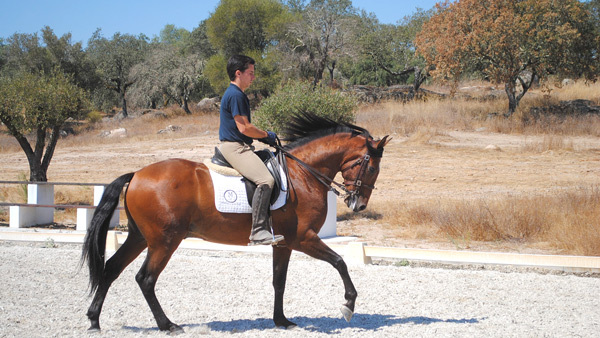 130 km from Lisbon airport to the equestrian center. Plan your arrival to the equestrian center before 6.00PM. Late arrivals (after 3.30PM to Lisboa airport) must book the above transfer service. Season 2017: High season: 1/4 - 31/10, 15/12 - 3/1. Low season: 1/2 - 31/3, 1/11 - 14/12. Credit card: Accepted at riding center. Tipping: Not necessary but appreciated. Closest village: 2 minutes with car there is a small village with restaurants and a supermarket. 15 km away is Arraiolos which is bigger. 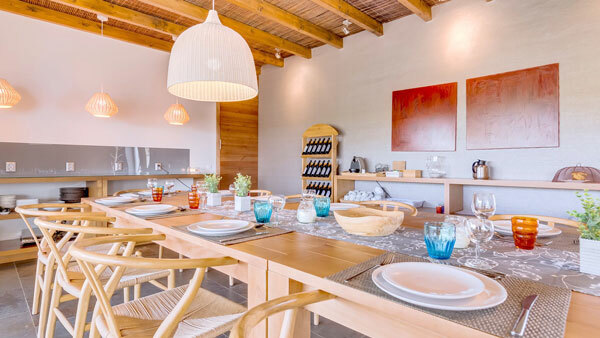 Beach: 1 hour away with car is Praia da Comporta, which is known for being very nice. Riding equipment to borrow: Helmet, short chaps. Other equipment can be bought in the shop. Special diet: Inform when booking. "Plenty, fresh well-prepared food at all meals. Good wines for lunch o dinner and always something sweet with our coffee. Super nice horses, very talented o dedicated instructors who really thought about the which horse they gave us and they gave us more and more challenges after each lesson. 10 points out of 10! Certainly a place we will recommend and you can recommend it to discerning guests with high demands on quality!" "Absolutely amazing riding holiday with a great bunch of people. 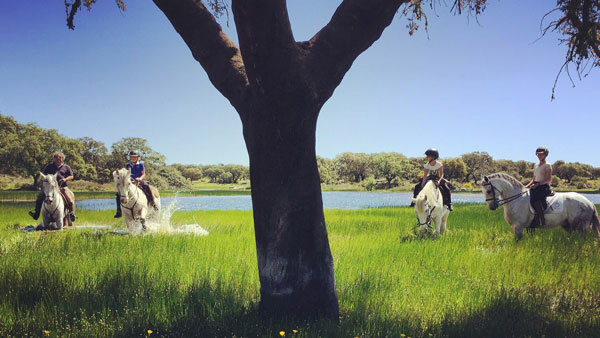 Combining yoga with horseback riding is the best combo." "Best workouts, ever !! Good instructors, very professional, which also the horse breeding and interest to compete on highest level testifies to. 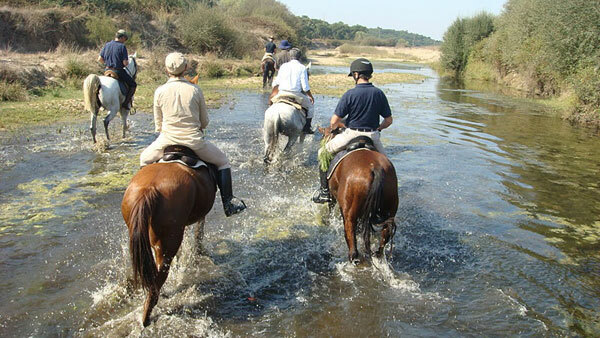 Well-trained horses, and horses that are suited for riders of different levels of education. I'am very pleased with my holiday." "Great instructors! Coralie, Joao, Andre and Cendrine. So dedicated and talented! Absolutely the best! Really nice skilled sensitive horses! Best of all the places we have been to. Highest quality of instructors and horses. 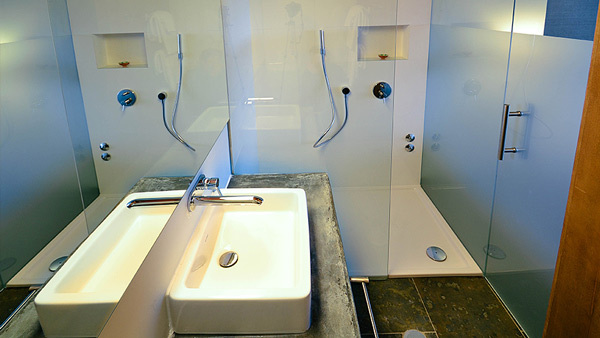 The shower on the patio was a fantastic experience!"